Smart cars aren’t generally know to feature more than two seats but the latest Smart ForFour is about to change all that. 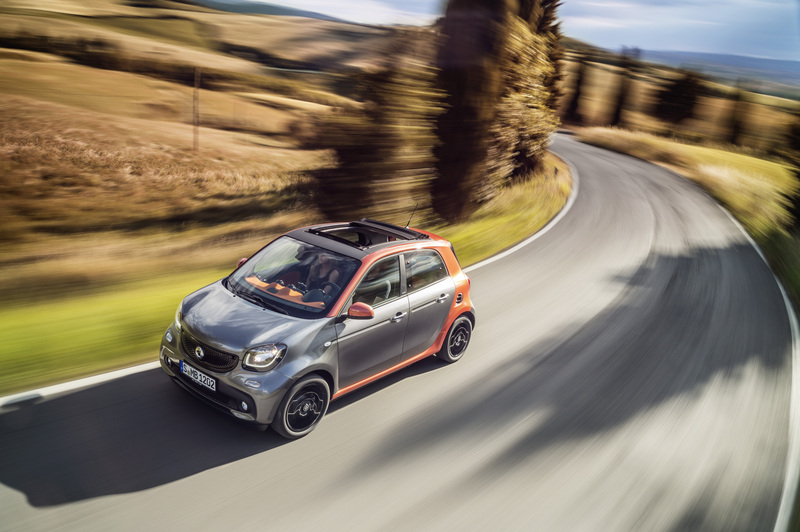 Smart have tried a four-seater before with the last model going out of production about eight years ago, but the ForFour has bounced back. The old motor was based on the Mitsubishi Colt, but this latest iteration is based on the Renault Twingo, not a car that you see a lot of on UK roads. In many ways, the Smart ForFour is the Twingo’s more refined and certainly more expensive cousin. 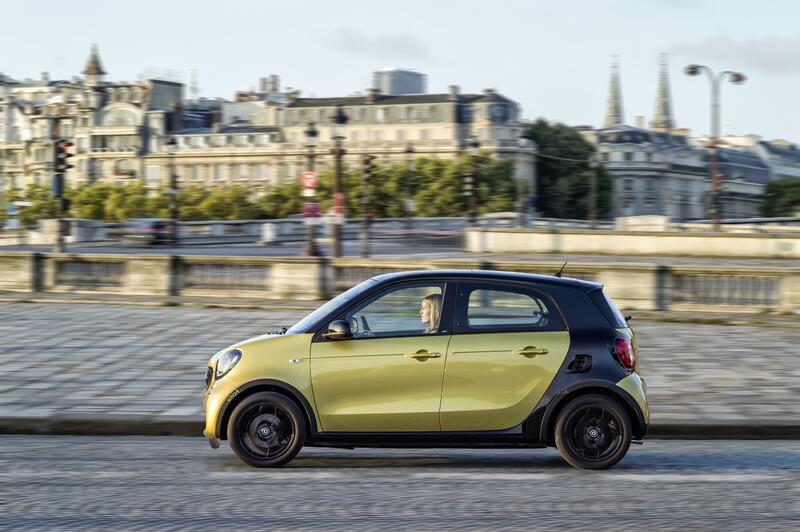 The Smat ForFour goes up against rivals such as the Hyundai i10, Volkswagen up!, Skoda Citigo, SEAT Mii, Kia Picanto, Fiat 500 and Citroen C1. The car sports a rear engine layout and phenomenal manoeuvrability. Its turning circle of 8.65m is only second to a London taxi cab, thanks to Smart’s Direct-Steer system. This is change from the old ForFour, which had the engine at the front. For a small car it has plenty of room, although only four seats, so only average-sized family need apply here. It is much more of a city car than a supermini, so its strengths lay in trips to the supermarket and picking up a couple of kids from school rather than a motorway journey. As mentioned earlier, the engine is at the rear and is petrol powered, the 0.9-litre engine has 90 bhp, while the one litre engine boasts only 69bhp. There is also a choice between five-speed manual and quick-shifting six-speed twin-clutch automatic gearboxes. On the inside, drivers have a lot of choice over trims. There are three of them (Passion, Prime and Proxy) as well as three option packs and 40 paint colours. Even with the lowest level of trim you get 5-inch alloys, automatic climate control, ISOFIX child seat mounts in the rear and cruise control. The removable cargo box and 50/50-split rear seats are also standard. As well as this, drivers get Daytime running lights, remote central locking, cruise control, a trip computer and electric windows. At a higher trim level, drivers get features such as panoramic glass sunroof, leather seating, sports suspension and larger 16-inch wheels. 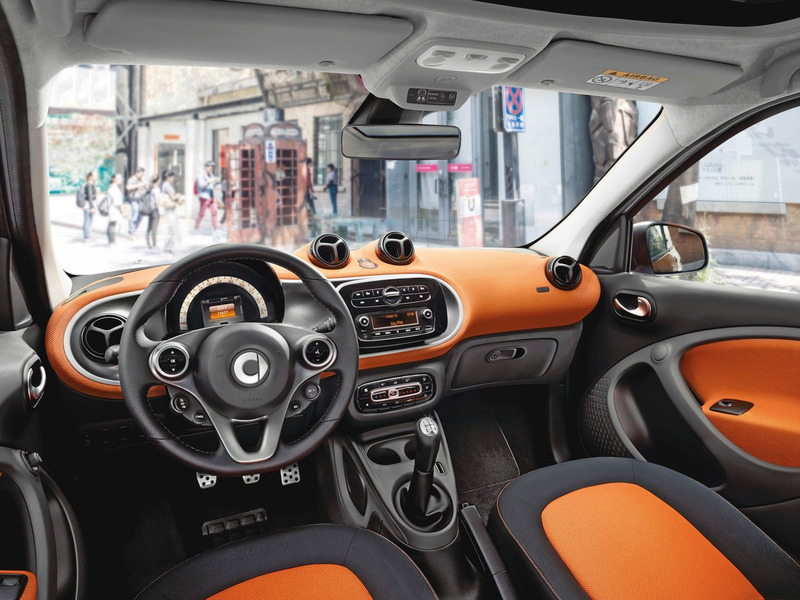 The interior is bright and funky and has plenty of choice for customisation. There are bulging gauges and instruments everywhere. Behind the wheel is a speedo and trip computer. Our test vehicle had the Smart audio system, which is a normal radio that can be paired up with a smartphone that you place in a built-in cradle. This somewhat hid the radio underneath. Also available is the Smart Media system but that costs extra and possibly not worth the extra cash if your smartphone has all the apps you need for a journey. Indeed, aside from the positioning of the smartphone cradle, this could be a better option. To be honest, most integrated satnav isn’t that great on the cars we have tested (this model we tested did not have integrated satnav so we cannot judge it). Hooking up the phone to the stereo is relatively easy and making calls through the system is good. When in testing, we could hear the person on the other end perfectly well through the car’s speakers and they could hear us. There is also a headphone jack and USB port to wire up any smart device. The cradle is only big enough for an average sized phone without too big a protective case. Our test iPhone 5S had a battery pack fitted and it was a very tight squeeze to fit this in, taking that pack off and just fitting in the phone itself would be OK. This does mean that fitting in a tablet, such as an iPad or iPad Mini is pretty much out of the question, which seems a shame. Once hooked up to the Bluetooth stereo, it signals to the device that the Smart Cross Connect app is available for download. This control the radio and volume via the app. It has many other features, one of which is something called community parking. This allows you to find the closest places to park to your car. This also lets you remember where you have parked too. Other people with Smart cars can upload places where they have managed to find spots where a Smart car can park, simply by recording the GPS coordinates with a click of a button. It also allows you to find points of interest, such as restaurants and petrol station and then direct you there. If you have Google Maps, this is pretty much a duplicate function. The app also makes note of your driving style and information such as fuel consumption and speed. The app also features a satnav function. The plus point of this is that you can download maps for when driving through areas where the mobile signal isn’t too good, but there are better satnavs available as apps that do the same thing. The point of the app is that it brings these functions together for ease of use. As you would except for a city car, the Smart ForFour is great around town but struggles on the motorway. Not that it can’t cope, it can. But it feels at times that it is being pushed to its limits. But for the weekly shop or dropping off the kids at the pool, it is great. The suspension make the ride comfortable and the direct-steer makes handling superb. As mentioned earlier, it has a tight turning circle which comes in handy if you decide against waiting in traffic and do a U-turn instead. You can sit a tall person in the front no problem, but the taller the person in front, means that there is less room in the rear. Also, there is no way you can fit three people in the back, there is no space nor the seat belt to make it safe and legal to do so; so four people is the limit you can carry. The rear doors also open to 85 degrees, so getting out of the car is no trouble. This does mean that boot space is actually quite good. The rear seats can be folded down to fit taller items in the rear, so that means a trip to Ikea is a distinct possibility with this car. Electronic stability controls also help keep the car on the road and it never once felt unsafe to drive no matter how sharp a corner was taken. There is also Crosswind Assistant to stop the car being buffeted by sudden gusts of wind. This is a great car for running around town and the performance merits as much. It is also a little more practical than its little brother in as much as you can fit another couple more (small) people and adequate boot space. 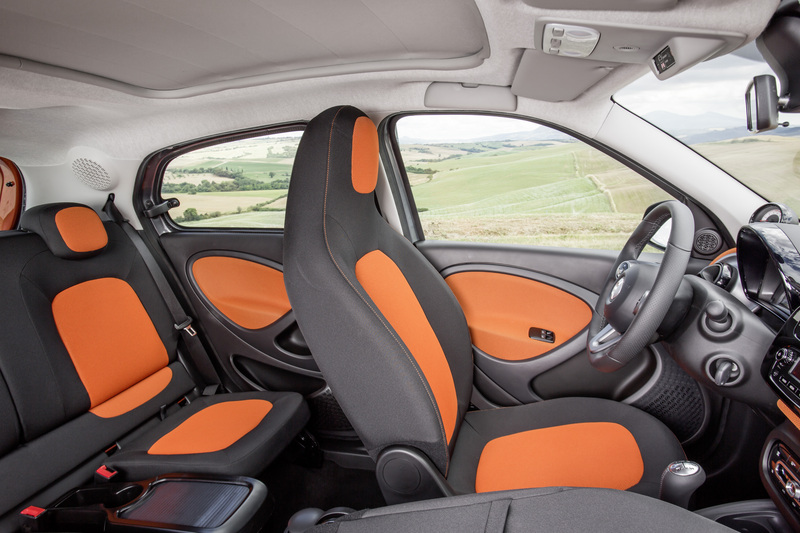 The Smart ForFour is compact, nippy, practical, safe & fun.